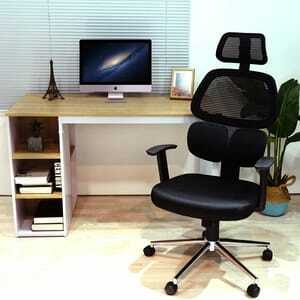 Category Archives for "Home Office Setup"
Why look for the best ergonomic office chairs? Sitting for long hours can kill your motivation, productivity and severely harm your health. Especially if you do so on a cheap, non-ergonomic chair – that’s like asking for a back pain. And as more and more Americans become inactive and spend their time sitting, it’s no surprise that even up to 80% of the American population will experience back pain at some point in their lives. What’s even worse, is that back pain is the single leading cause of disability. And yet, many times it could have been prevented. 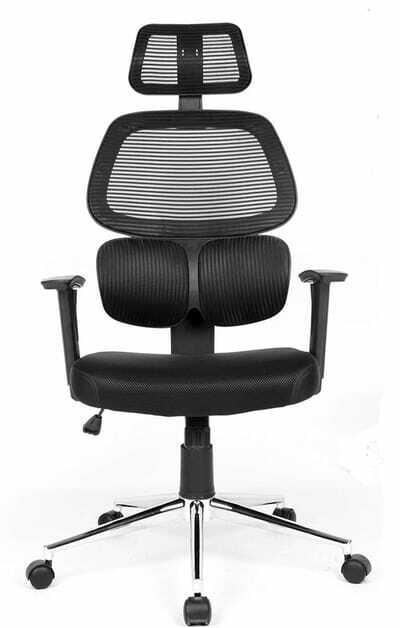 One of the keys to doing so is working in a comfortable ergonomic office chair that’s designed to protect your back. Why working in a low-quality chair is not an option? Amazon – That’s Where All the Gems Are! One of the biggest reasons why people invest in ergonomic office chairs is limiting the negative impact that hours spent sitting have on your back. By changing your chair to one that’s back-friendly, you will find it easier to keep a good position when sitting and experience fewer back problems, boost your productivity and spend less time and money visiting doctors to help you deal with your spine and back problems. + Better blood circulation – if you sit in a chair that’s too high or too small for you, certain parts of your legs will be more pressured than others. If the blood cannot flow through the veins in your legs properly, you may develop blood clots. If you feel tingling and cramping in your legs, it’s time to get an ergonomic place to seat so that you can adjust it properly. + Healthier muscle balance – by sitting in a properly adjusted chair, your bodyweight is balanced much better on your hips and buttocks. This prevents pain and helps you keep your muscles and tendons stretched without favoring one over the other. This leads to a much better posture when sitting and walking. 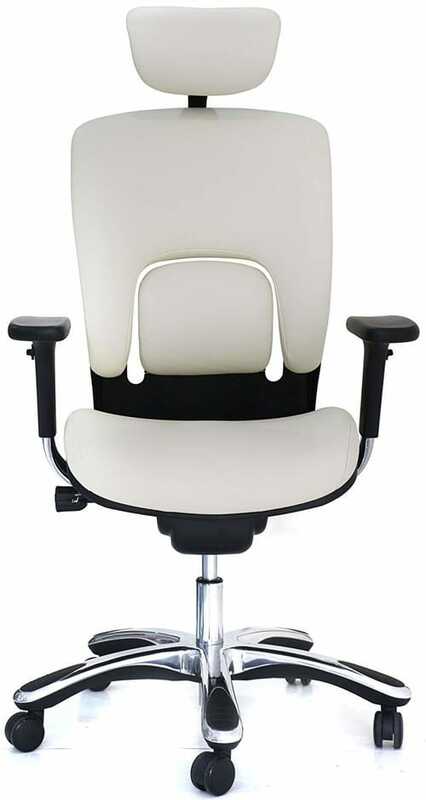 + No shoulder and neck pain – on top of affecting your back, poor-quality non-orthopedic office chairs can cause a lot of discomfort in your neck and shoulders. The best ergonomic office chairs for neck pain come with add-ons such as headrests and comfortable, padded armrests. These reduce pain when sitting, as well as help prevent discomfort even after you finish working. Naturally, there are much more benefits to reclining office chairs than the above – but, those are the most important ones when it comes to the health of your back. So, how much will one of them cost you? 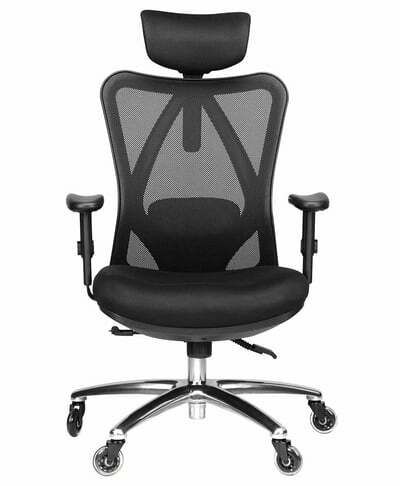 On average, best office chairs for back support cost between $120 - $180. But, it’s possible to find gems for as little as $40 or $50 – however, you need to know what to look for. This is because there are very few chairs worth considering in this price range. Otherwise, everyone would be working in one by now. Of course, there are reclining office chairs that go well into thousands of dollars. But, in this article, I will focus on those that don’t go over $300. So, what is the difference between them and the more expensive ergonomic office chairs? The latter come with more adjustments and are made of better-quality materials (read: are more durable). You can learn more about those high-end models and read their reviews in this high end chair article. 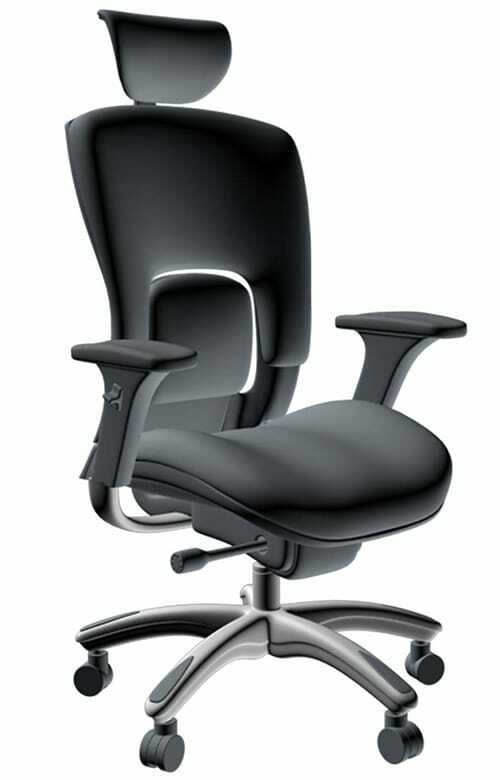 Keep in mind that the purchase of an ergonomic office chair should be treated as an investment. This is because a better chair will help you boost your physical and mental well-being. This will lead to a significant productivity increase, giving you more time to develop new skills, pursue your hobbies or simply enjoying life with your family. Naturally, you need to choose a healthy chair first – what do you need to know to do that? Allow you to dynamically change your sitting position. You’ll notice that all recommendations include reclining office chairs. This is because keeping a fixed position for hours is way more unnatural than sitting itself. By changing your position (for example, by leaning a bit further back) you temporarily shift the stress and tension onto other parts of your body. Be able to accommodate you. If you are tall, ensure that the seat is deep enough and the backrest long enough to provide you with enough comfort. Similarly, if you are short, ensure that you’ll be able to comfortably put your feet on the ground. Keep your joints and muscles in a neutral position. 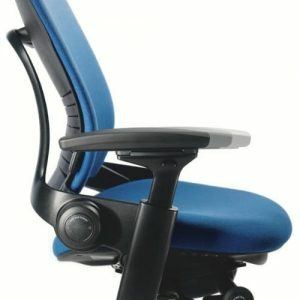 The best office chairs for back pain cause no feeling of discomfort or stretch when you sit in them. If that’s the case, it could be that the chair is not properly adjusted. Fit the workspace. While your needs come first, you need to ensure that the size of the chair is a good choice for the desk that you work at. Obviously, if you have a quality ergonomic desk, choosing the right chair should not be a problem. Be safe and easy to use. Even though it’s just a chair, it’s your health at stake. While they are not explicitly called orthopedic office chairs, they should act like one. It means that a good chair shouldn’t force any positions that could cause stress or pain. And the adjustments should be easy enough to operate so that anyone can set them right for their posture. Be made of materials that you like. Some people prefer meshed chairs while others can’t live without a leather padding. Since you are going to spend long hours in it, make sure that it’s made of the right materials. Fit your sense of style. This has little to do with your physical health. 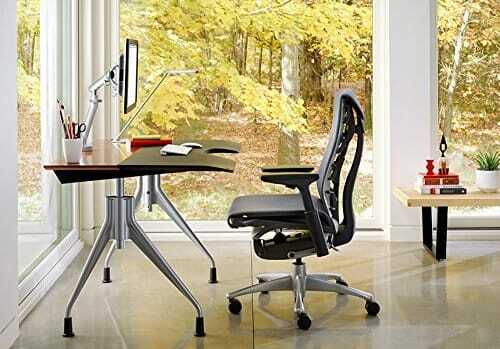 But, having a chair you simply like for its style, makes it much easier to sit down and get to work. Knowing what to look for, let’s get to actually purchasing one. What’s the best place to look for affordable ergonomic chairs? Why all the best deals can be found on Amazon? Don’t ask me – I think Jeff Bezos could give you a much better answer. But, it’s a fact that all the best office chairs for back support are there. And it’s no surprise – in the end, there are not many eCommerce stores offering such a great user experience. Now, let’s take a quick look at each of them to find the right one for you! Some chairs are just comfortable while other can actively help you reduce or get rid of the back pain. This focus on helping you take care of your back is one of the reasons why many buyers love Modway Articulate. Thanks to all of its adjustments, Modway Articulate is, in my opinion, the best ergonomic office chair for sciatica and hip pain. The wealth of options ensures that you simply have to find the right position that’s comfortable and safe for your back. What I Like about This Chair? Adjustments – apart from all the standard backrest adjustments, Modway Articulate features one-touch chair height adjustments, 360° swivel, tilt and lock system and height adjustable armrests. All this makes it close to impossible to feel uncomfortable in it if you do the work upfront. Comfortable padded mesh seat. On top of being comfortable, it’s highly breathable so you’ll feel fresh even after hours spent sitting. 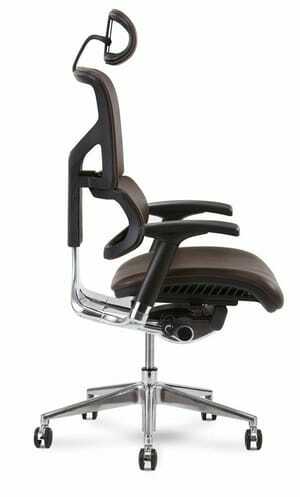 Moreover, thanks to its super thickness, the chair is even more comfortable and there’s less pressure on your legs. Sturdy and supportive – it can accommodate people up to 331lb. Despite many adjustments, some of them are quite minimal, such as the second tilt level. In fact, the tilting/lifting mechanisms are a bit behind high-end chairs. The instructions are quite ambiguous and don’t show all chair elements clearly. Modway Articulate is an excellent choice for anyone who wants a classic and comfortable chair. Some chairs are perfect when it comes to helping you with one thing but they lack that one or two extra features that’d make them perfect. While it’s also a problem for Flash Furniture Task Chair, it doesn’t mean you shouldn’t consider it. At first glance, this chair has everything you could ever need. It looks great (nothing too fancy but it’s not too boring either) and features a comfortable mesh mid-back and a padded leather seat. 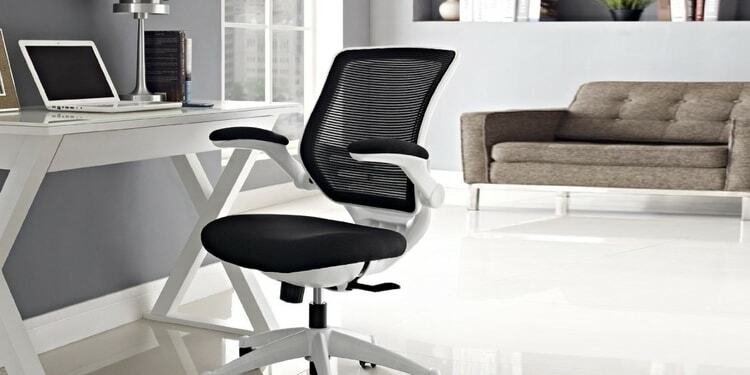 On top of that, thanks to its top-quality lumbar support it’s the best ergonomic office chair for tailbone pain. But, the armrests aren’t adjustable and can be really uncomfortable. 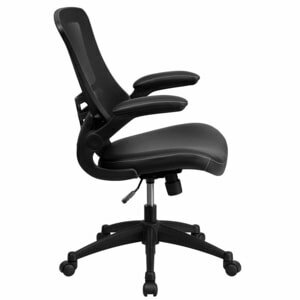 High-end lumbar support in an affordable chair. 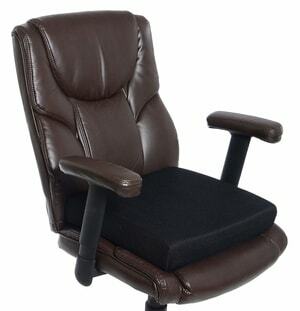 This chair feels super comfortable around your lumbar and tailbone areas and can reduce any pain that you feel there. It’s also very well-made overall which means it’s a good choice for back pain in general. Stylish design. 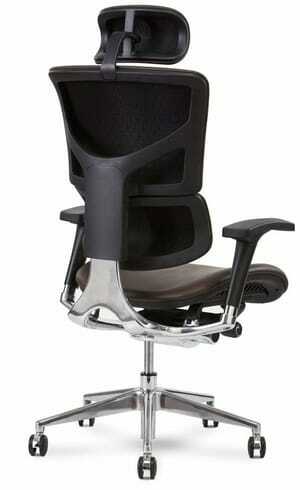 As I said above, it looks exactly the way I believe a modern ergonomic chair should look. Terrible Wheels. Unless you change them for a scuff-free set ($15 – $20 on Amazon), they will damage your hardwood floors in an instant. You could also remove them completely but it’d kill the ergonomic aspect. Compared to the rest of its great features and design non-adjustable armrests sound like a sad joke. A wasted opportunity. Considering the very affordable price, I believe it’s a very decent product for anyone who is suffering from lower back and tailbone areas problems. But, you might consider removing armrests which is something I usually recommend against. 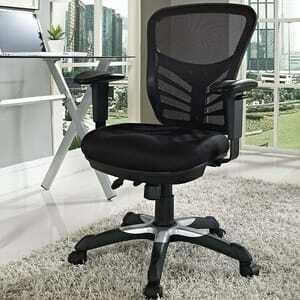 Top office chairs can easily set you back a thousand or even two thousand dollars. 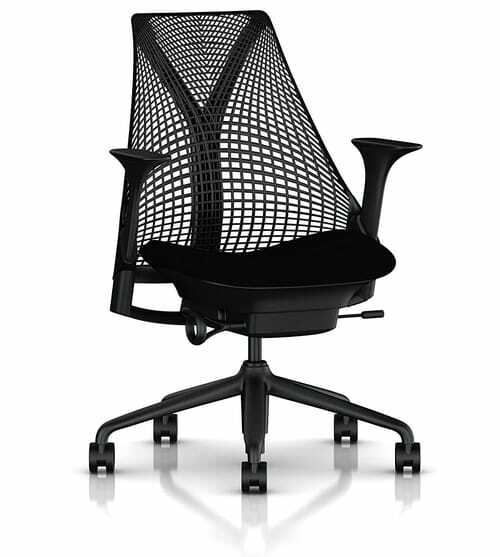 But if all that you need is an affordable but comfortable and good for your back piece of furniture, there are some real gems out there – such as the Furmax Office Mesh Chair. Can a chair that costs 20, 30 or even 50 times less than its more expensive competitors still offer you a quality sitting time? The answer is a strong “yes!”. Naturally, it won’t come with all the adjustments and gimmicks that top chairs have to offer but if you have a small budget, there’s is no excuse not to improve the quality of furniture that you use. Great quality to price ratio. 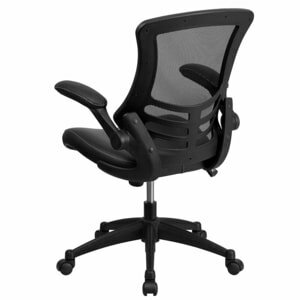 Its super low price and decent manufacturing mean it’s a very solid chair available for pennies. Fits short people perfectly. It’s not the biggest chair out there but is very comfortable for people below 6’. Great introduction to ergonomics. It’s a perfect choice for your first ergonomic chair. Its assembly instructions are written in poor English and are quite confusing, making the chair hard to put together. A short back can be very uncomfortable for tall people which makes the chair useless for those who are looking to support their back properly. Some would say that it’s impossible to take proper care of your working conditions on a budget. But, Furmax office chair proves quite the opposite – it’s no surprise it’s the #1 bestseller in its category. Ergonomic furniture manufacturers are always looking for ways to distinguish the product from competitors. Because of that, some chairs look very futuristic. Others look classic and modest. 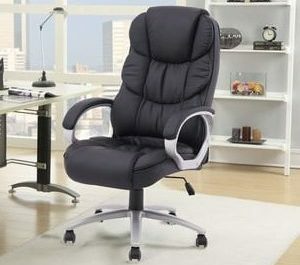 And what about BestOffice Executive Chair? It screams comfort the moment you look at it. And it’s not just the way it looks. It comes with a cushioned back and seating which are both comfortable and still firm enough to properly support your body. All that is topped with pretty decent armrests and chair height adjustments. Great for tall people. The back support is quite high providing you with lots of space. Even though it’s cushioned, it’s still firm enough to stabilize your body properly. Great, modern look. 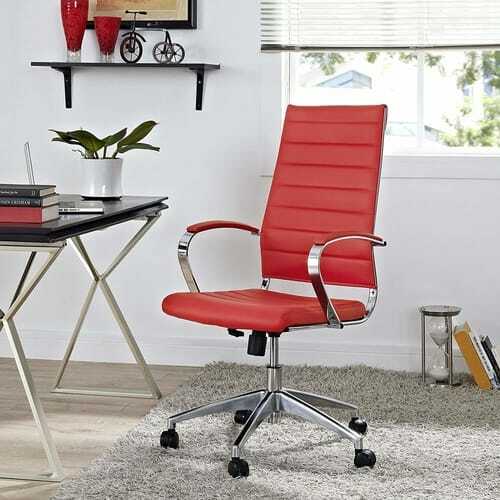 The chair fits any office space perfectly. Affordable. You won’t find a better leather chair at that price. Hidden tilt mechanism – it’s not advertised but it’s there. You need to take care of it carefully. Otherwise, the leather can start peeling and separating from the stitching, drastically reducing the lifespan of the chair. Fixed armrests. Sadly, you can’t adjust them in any direction. It can smell pretty bad once you unpack it. But the smell disappears after a week or two. 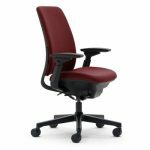 If you’re too tall for the Furmax chair and are looking for a comfortable chair that looks highly professional – BestOffice Executive Chair is your #1 choice. The difference between very expensive ergonomic office chairs and their more affordable equivalents is usually in the quality of materials used and the number of adjustments. But what if you could get a chair that’s just as adjustable for 1/10th the price? There are two things in which Coavas chair excels. The first one is getting attention. No matter where you put it, you can be sure that someone will ask about it as it looks much different than a usual chair. But it’s not just about the looks – the second important benefit of this chair are all the adjustments that it comes with. Good for tall people. At 25.8”L, 25.8”W, 47.6 to 51.6”H it will perfectly suit even people above 6’ tall. Decent Head Support. If you suffer from neck pain, you will appreciate the quality headrest. Futuristic design. As I have already mentioned above, it does look very modern and unique. Great adjustments. You can adjust everything from armrests to seat height and headrest. Quality lumbar support. If you are tall and suffer from lower back pain, this chair is the best choice in its price range. Hard to assemble. Because of all the things that you can adjust in it, it takes some time to put it together. Can get wobbly. Especially if you play with the adjustments a lot, so you need to be careful not to put too much pressure on adjustable elements. Doesn’t fit every office. The design, whereas very original, might not be a good fit for a conservative office space. But it’s an excellent choice if you plan to use it at home. 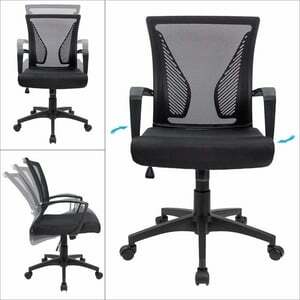 Coavas Mesh Office Chair is an excellent choice if you are looking for a highly adjustable chair on a budget. The drawbacks are, it’s quite hard to put it together (especially to do it alone) and that over time, it might get wobbly if you play too much with the adjustments. 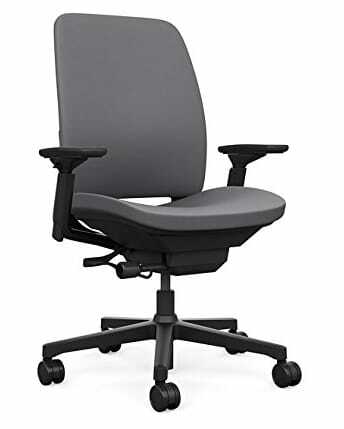 If you’re looking for a comfortable chair made of a quality breathable material that’ll keep your back cool and rested, this Duramont chair is worth every penny – regardless of its slightly higher price compared to the other chairs in this list. Even though Coavas was already a very decent chair in terms of lumbar support, this is where Duramont truly shines. But, it costs more than double the price. On the upside, it comes with adjustments such as the ability to control the distance from the seat to the backrest, which is usually available only in high-end chairs. 330lbs limit makes it a safe and comfortable chair for large people. Looks better than similar chairs. Perfect if you need a modern chair with a headrest but want something that looks rather modest. Breathable, high-quality mesh. Your back won’t get sweaty even on a warm day. Top notch lumbar support. 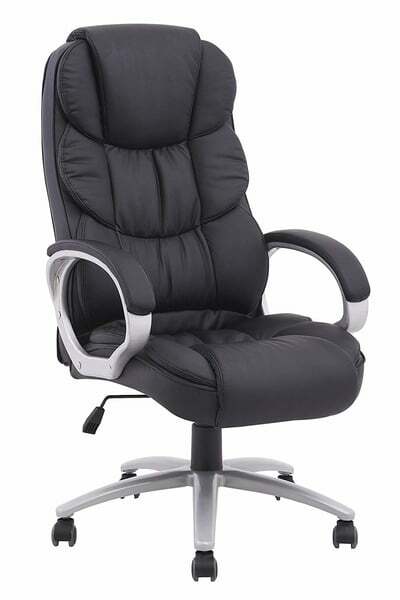 Provides your lower back with more comfort than any other chair reviewed in this article. Highly adjustable. Thanks to all the adjustments, you can highly personalize it – not to mention that it’s very comfortable for tall people. More expensive than other inexpensive back support chairs. You have to pay extra for it (still less than 1/5th of the price of a similar high-end chair). You need to adjust the width of the armrests during assembly as you can only move them up and down once the chair is put together. But, if you do it right, it’d be really comfortable for someone with shoulder pain. It’s hard to put together – luckily, the instructions are very clear. To sum up, I believe Duramont is the best office chair for back support you can get for the money – whether you need it for work, home or gaming. 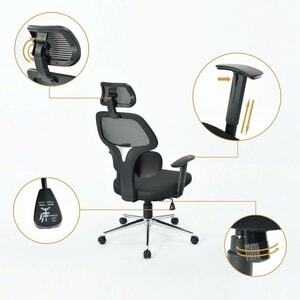 Other chairs that could compete with it cost at least $800 - $1200 more. And what if you haven’t chosen the best office chair for back pain yet? Don’t worry – just go over the list of best ergonomic office chairs once again and click the link next to the chair you like to learn more about it. Just don’t forget to pick the right size as it’s critical, especially if you’re tall. Why do we office chair back support pillow and cushions? Some say that sitting is the new smoking. Unfortunately, we sit more than ever before – at work, in a car, watching TV. What’s even worse is that, apart from limited physical activity, the majority of chairs that we use are not designed to support our backs. But, there is one thing you can do to improve your back health without changing a chair that you sit in – getting a back support pillow. Why Does It Work and How to Choose One? The main idea behind a back support pillow is that it helps position your spine and back correctly – regardless of the chair that you use. Research shows that having the right pillow helps decrease lumbar flattening and increase thoracolumbar curvature, improving the level of health and comfort in patients with low back pain. Its thickness. Some pillows are thicker than other – the ultimate choice will depend on how much support you need and how soft is your current chair. A removable, washable cover with a sweat absorbent fabric. Because a back support pillow is squeezed between you and the chair for hours every day, it’s important that it’s easy to keep it fresh. 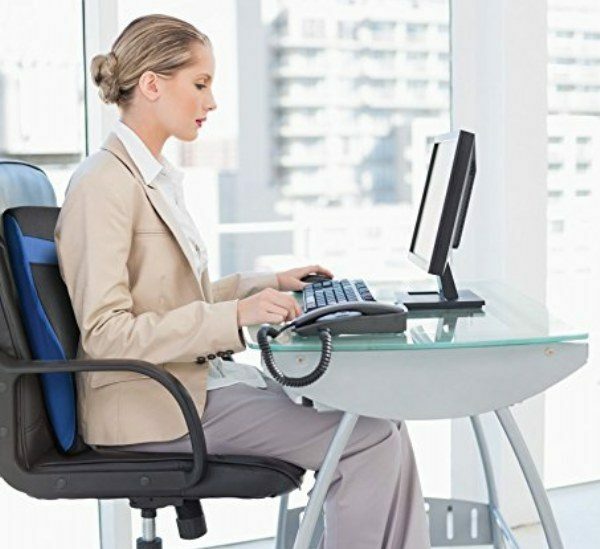 Straps quality – what’s worse than having no back pillow for your best office chair? A pillow that’s positioned incorrectly and hurts your back instead of helping you. Naturally, the list could go on and on – but the above three are core things to keep in mind when picking a product for you. So, what are some of the best back support pillows and cushions? A quality back support pillow should allow you to use it anywhere, anytime. And while you can take just about any pillow with you, you want to make sure that it’s not only comfortable but actually stays fresh throughout the day. The LoveHome memory foam pillow comes with one of the best breathability rates in the market, which means it works great both indoor (with an office chair) and outdoor, even during a very warm weather. What I Like About This Office Chair Back Support Pillow? Top-notch breathability. Minimizes the risk your back will get all sweaty. Quality buckle and two straps. Unlike single-strapped back support pillows, LoveHome’s one won’t slide down when you leave the chair. Metal Zipper. Ensures the zipper will last much longer compared to a plastic one. Great customer support. When you are selling hundreds of products, it’s normal that sometimes one or two defective ones get shipped. The real difference is in the way you deal with your customers. This retailer does an excellent job at it and offers 60 days no-questions-asked money-back guarantee. So why not try it out first? Not tight enough on wide chairs. Despite having two straps it’s hard to tighten it properly on a wide surface. You can’t fully remove the straps what limits the number of ways in which you could use it. A quality, inexpensive back support pillow for chair. Sometimes products become so popular that it’s hard to say whether they are selling so well because they are good or because of the snowball effect. What’s the reason behind the success of this Amazon’s office chair back support bestseller? 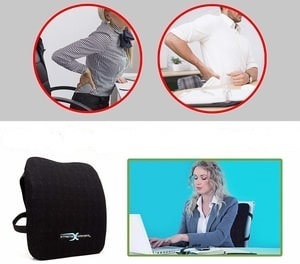 This lumbar support pillow is an example of a product that slowly “learns” your body. While it nicely conforms to the natural curves in your spine out of the box, as you keep using it, it adjusts to them even more accurately. High-quality soft memory foam. Very comfortable even after long hours spent sitting. Breathable. Helps you stay fresh and prevents excessive sweating of your back. Secure double straps. 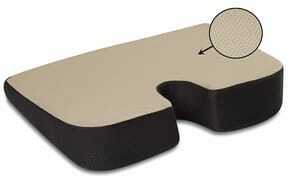 These help the pillow stay in one place so that It doesn’t slide down when you sit or stand up. Long and weak straps. Unfortunately, the straps are not the best quality and are pretty hard to tighten properly on uneven surfaces. Quite bulky. Because of its shape, it feels big and takes quite a lot of space. 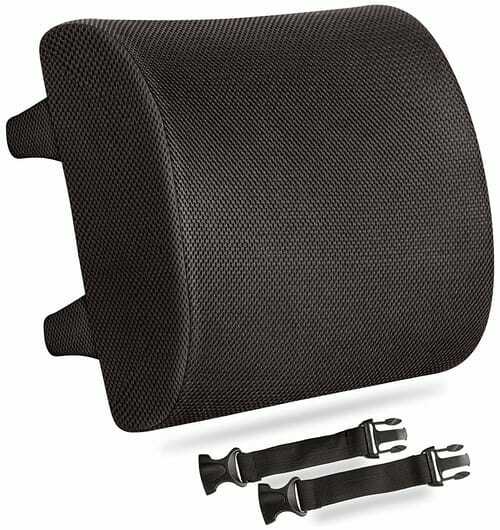 Despite just above-the-average straps, this back pillow for chair is a really good product. While I’m sure there are better ones. Sometimes pure lumbar office chair back support is not enough – especially when you need to get your whole back covered. This is where Vertteo pillow comes in. 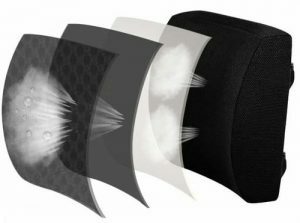 The team behind the pillow’s design worked closely with chiropractors who deal with back pain on a daily basis. Thanks to the pillow’s fullback support, it protects both lower, as well as the upper, thoracic area of your spine. Comfortable anywhere even during travel. Its unique design makes it possible to enjoy the benefits wherever you want – from an office chair to a sofa. Taller than a standard lumbar pillow. 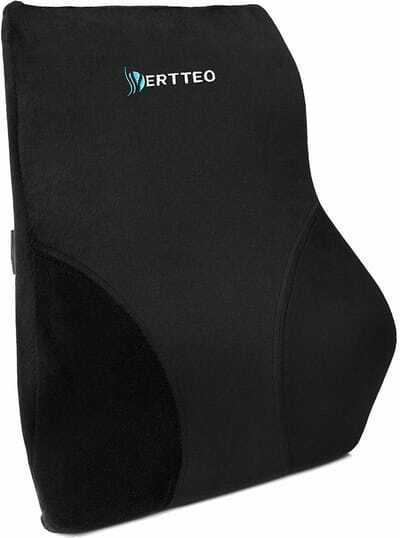 This is important both for those who want to protect their upper backs as well as for tall people. Works great as a replacement. 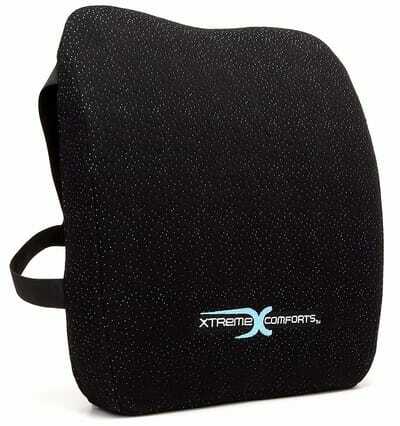 Because of its size, it can be used as a quality replacement for a backrest cushion. Just one elastic strap. Sadly, it’s not enough to hold the pillow especially if you use it a lot. Still not tall enough for some two-piece chairs. Despite the emphasis on height, it’s still too small to be used on some of the bulkier chairs comfortably. 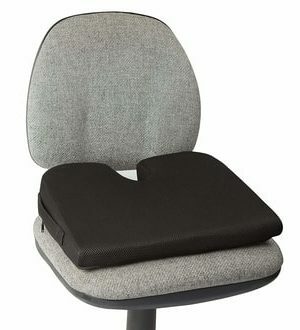 A good back pillow for everyone looking for a full back office chair back support. Unfortunately, what could have been a great product misses some important features such as a second strap which would help to stabilize it and keep it in the same position. The number one drawback many office chair back support pillows have is that they ultimately become very flat. But, that’s not a problem for the Desk Jockey clinical grade memory foam pillow. 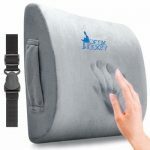 To achieve the best results and provide their customers with a top-notch product, the team behind this pillow worked with a board of certified physical therapists what helped create a super comfortable and convenient in use therapeutic-grade pillow. Easy to move around with it. Thanks to a free travel and storage bag and a convenient handle you can take the pillow anywhere with ease. Plus, it looks great. Free extension strap. Mounting your pillow on extra-wide chairs has never been easier. Can be used even on soft surfaces such a sofa. Because it’s quite thick, you can use it on soft furniture and still sit quite comfortably. Great pillow for lower back support for tall people. But, because of its bulkiness, it may not be comfortable for a short person. Could be too thick – but this will depend a lot on personal preferences. 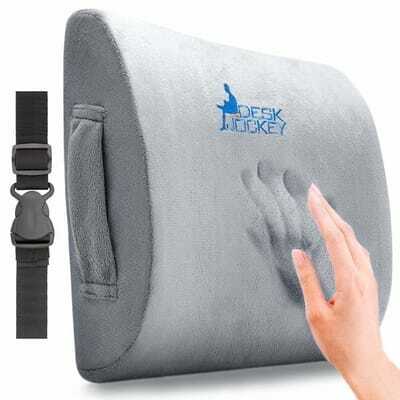 The Desk Jockey office chair back support for chair is an excellent and very comfortable office and travel companion. If you would like to take the comfort of sitting to the next level, getting this very pillow is a the right step to achieve that. 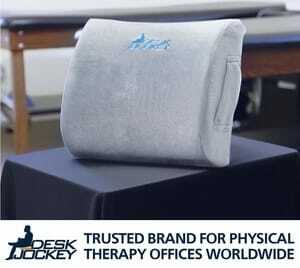 As a back pain patient, I found that working with this office chair back support, along with the right productivity system, helps you become more productive at work. Some pillows are comfortable, others are thicker but very durable and come with solid straps. But there are also pillows that merge all the most important features into one premium product. 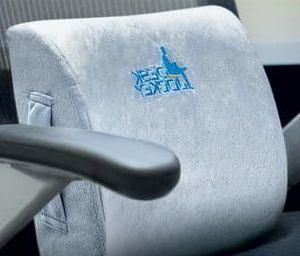 Xtreme Comforts back pillow for chair combines everything that’s best about ergonomics with top quality materials and manufacturing. This resulted in a product that’s not only comfortable but can actually last you for months without losing any of its properties. Well-made straps. They are not only durable but also great at keeping the pillow in one place. Supports both lower and upper back. Thanks to its height, it can provide your back with a much more complex protection. Greatly enhances the comfort of a large chair for a small person. Poor return policy. Even though the seller advertises lifetime replacement guarantee, some customers reported having problems with returning the pillow. Too thick for a car. It can be a bit too thick for a small car seat. Even though the pillow from Xtreme Comforts is top-quality, I have some mixed feelings about it. This is mostly because it’s a real hit or miss – some users will fall in love with it while for others it will be too bulky or too thick. Office chair back support pillows are just one part of the equation in search of a perfect work environment for your back. Another great accessory that can significantly improve your back and productivity are soft office chair back support pillows. They come especially handy if you’ve made the mistake of buying a rock in disguise as a chair or got one without considering user’s height. Naturally, it can be used outside of office too – quality seat cushions work great anywhere you sit for a prolonged period of time – including sofas, car seats or benches. 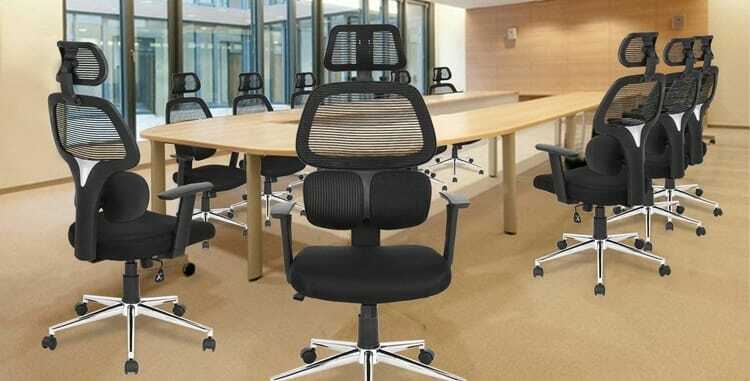 There are many reasons why people buy seat cushions for office chairs. Some of them want to relieve coccyx pressure. Other want to avoid flat buttocks and the pain it may cause. But the ultimate reason is always the same – comfort. AERIS premium office chair cushion was designed with one major goal in mind – to provide its users with the highest level of comfort. And, to be honest, it does that very, very well. Very comfortable to sit on. It’s no surprise it’s a premium product – it’s hard to find a more comfortable cushion. Spacious. It’s big enough to easily cover an entire seat of a wide chair what makes sitting on it even more comfortable. Perfect choice for short people who need to get a slightly elevated office chair without buying a new one. It’s not the best choice for heavy people. Unfortunately, it can get compressed so hard it loses all its softness. Takes some time to decompress. On top of the above, you’ll need to wait before it’s comfortable again. Slipperiness. Unless you sit bolt upright on it all the time it tends to slide halfway off the chair. Sometimes a standard soft cushion is not enough – no matter how comfortable it is. 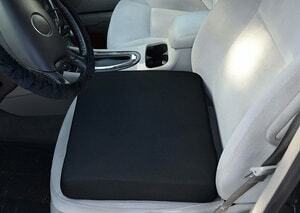 This is where TravelMate hybrid seat cushion comes in. Apart from providing you with an elevated and comfortable surface to sit on, TravelMate can help you get rid of tailbone pain when sitting thanks to its gel-enhanced memory foam. Non-slip cover. It’s designed so well that it prevents the cushion from sliding even on a polished marble floor. Can be used as a back cushion. In fact, works very well as one. The hybrid, gel-enhanced version is designed specifically to help relieve from tailbone pain. It needs some “break-in time”. It’s very firm in the beginning and you might have to sit on it for some time before it adjusts to you and becomes more comfortable. Softening. The more you sit on it, the softer it becomes. While it will last you for months, you’ll inevitably have to change it. The standard model of Travelmate is good at best. The third cushion in the list is a solid compromise between an affordable price and quality. While it’s not a premium product, it’s still worth the money – especially if you’re looking for an inexpensive seat pad for office chairs. We've sat in this seat and it was very comfortable. Along with writing this article on motivation, it was a perfect compliment to my office chair. But, there is a catch - it works great only on soft surfaces. This is because it’s made of memory foam, which will never be as firm as one that is mixed with a regular foam. While this is true for many pillows and cushions, the softness is especially visible in this particular one. 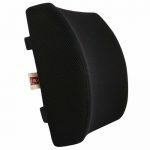 What I Like About This Back Support Cushion? Retains shape for a long time. Despite being pretty soft, it quickly adapts to the way you sit on it. Great price. Definitely worth giving it a try, especially if you’ve never used an extra office seat cushion before. Leaves stains when wet. Don’t use it on white surfaces that could get dirty and are hard to clean. Gets very flat. Because it’s so soft, it can get really flat – that’s why I don’t recommend using it on hard surfaces. Scratchy and uncomfortable mesh. It’s not the best choice if you plan to sit on it in shorts. People at Milliard did a good job creating an inexpensive and very comfortable memory foam cushion. But, because it’s made of just memory foam, it’s not the best choice for surfaces that aren’t at least slightly soft already. 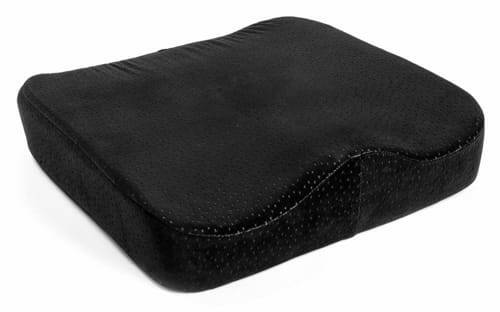 Back support pillows and cushions for office chairs are an excellent way of improving the comfort of your office chair, car seat or even a sofa. And all that comes at a very affordable price, much, much lower than the cost of an ergonomic chair. Because of that, there are no reasons not to start taking a proper care about your back – if you haven’t picked the right pillow yet, just scroll up and go over the reviewed models once again. If you’ve ever created or remodeled your workspace, I’m sure you know that all the costs can add up pretty quickly. And one of the things that are often the biggest burden on your budget is a comfortable office chair. Sadly, that’s where many people skimp – which I think is a huge mistake, especially if you take into consideration that a high quality (and, sadly expensive) chair can offer great ROI. What makes it such a great investment and why you should pick one? Why Are They Called Expensive Office Chairs? Are These Chairs Really THAT Expensive? Is Buying an Expensive Office Chair Online a Safe Option? 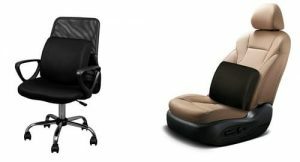 How to Choose the Right Chair So That You Don’t Waste Your Money? To understand how an expensive office chair can make you money let’s first think about the most obvious stuff that distinguishes expensive chairs from their more affordable counterparts. Obviously, I will skip the price (which is, surprise, surprise, higher) – some say that if you are spending less than $200 on a chair, you’re not buying anything good. But the real difference is in the quality of the final product. Usually, cheap chairs have almost no padding and are made of low-quality materials. What’s more, there are usually very few (if any) adjustments, what makes it very hard to adapt the chair to the way you usually sit and work. Not to mention that they are super generic and provide no real benefits. At the same time, some of the best expensive chairs took years to design. During that time, researchers, doctors, scientists, and engineers were all working together to create the healthiest and most comfortable piece of furniture out there. Naturally, not all expensive office chairs are research-backed. But, that’s not the only reason why the best models are worth the money. Another reason is the quality of materials used and the customizability. 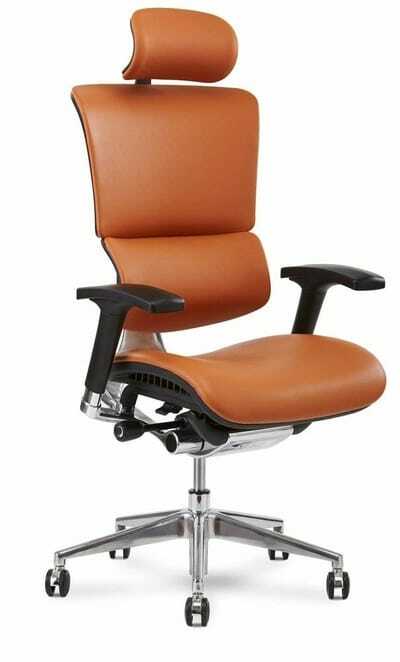 High-end office chairs are made using top-quality materials such as leather or polyurethane. On top of that, they often come with all the adjustments you might be wishing for, making them extremely comfortable even if you sit for hours every day. This is where we come to the main question. One of the core benefits of expensive office chairs is that they are crazy comfortable. This means that you won’t get tired as fast as you would in a normal chair. By keeping your body and your spine in the right position using special adjustments, they increase your productivity and allow you to be more efficient. Imagine adding just 12 minutes (modest estimation, rounded for easier calculations) to your effective working time per day. This equals 1 hour extra every week. Let’s do the math. If you earn $35 per hour, this equals an extra $1820 every year, which means you will easily make back the price of the chair. And, considering that these chairs often come with at least 15 year-long warranties, your investment is secured for years to come. And this is just one of the many savings that you get with it. A better health, more (quality) time spent with your family or pursuing your passions – are all invaluable benefits of expensive office chairs. Furthermore. 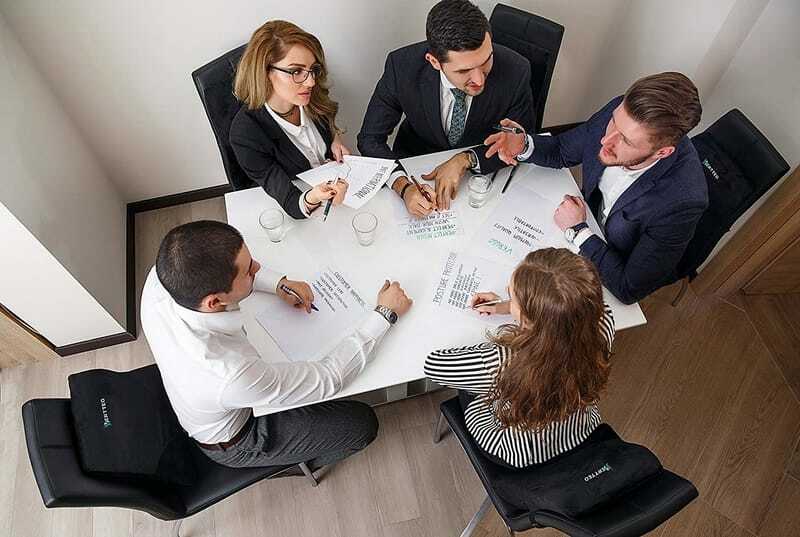 if you own a business, you might want to consider buying the chairs for your employees – it’s a proven fact that companies incur thousands of dollars in lost productivity and medical treatment costs every year. So, knowing that getting an expensive office chair is a no-brainer, what’s the best place to get one? Thousands of people shop online on a daily basis. But, the majority of them doesn’t spend any significant amount of money – at least not in one transaction or for one product. And the price of a chair that’s capable of providing you with comfort and ensuring that you have a healthy and productive time can go well beyond a thousand dollars. This is why it’s best to purchase chairs from well-known retailers such as Amazon who have an impeccable buyer protection policy. So, you now know where to buy the chair and what are the best brands to choose from. Now, let’s look at how you can pick the best chair so that your money is a good investment for years to come. Arm comfort. 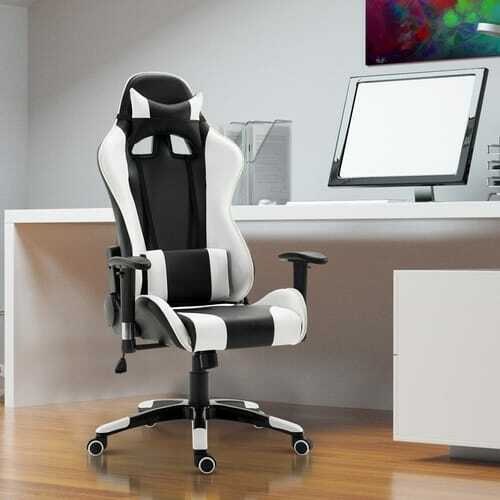 Does the chair come with armrests (I advise against chairs without them), are they adjustable and comfortable? You might want padded ones, though some non-padded are just as good. Spine protection. Can you adjust the backrest vertically, as well as backward and forward? Can you change the height of the chair? Remember that your feet should be flat on the floor. 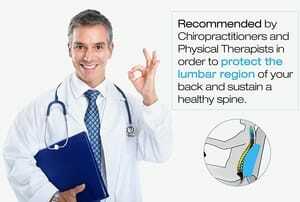 Lumbar Protection. How well does it take care of your lower back? Five-star base. This ensures perfect stability. General Comfort. This goes together with all the previous points. On top of all that has been mentioned, check whether the width and depth of the seat are good for your body. This is especially important when looking for office chairs for a large person. On top of the above there are things such as colors or whether the chair is upholstered or mesh. But these are of secondary importance when it comes to your productivity. Naturally, all of the chairs in the below list meet the majority, if not all, of the above requirements. 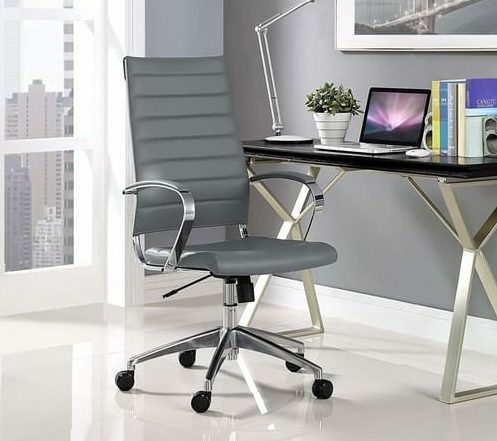 Apart from comfort and durability, some expensive office chairs have one other significant advantage over their competition – they look totally different than a typical chair you can find at the local furniture store. 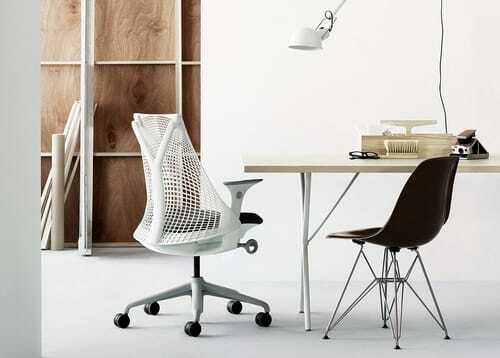 One of such chairs is Herman Miller Sayl Task Chair. The chair lacks hard edges and doesn’t have a typical frame. 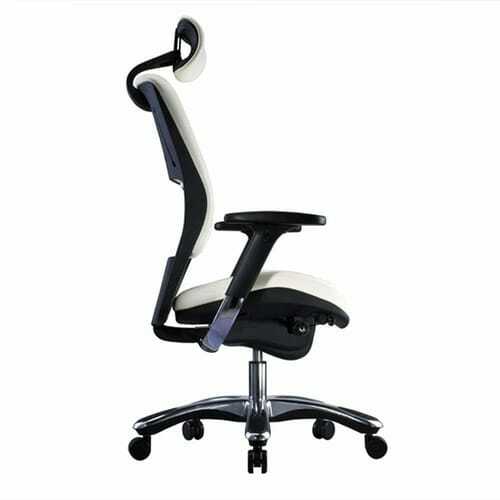 Its shape, while it doesn’t look close to a standard chair, provides great support for people of all body types and adapts to their unique shape. Additionally, its stable frame makes it a good choice for a large person. Affordable. Especially compared to other chairs from this brand. Unique Design. 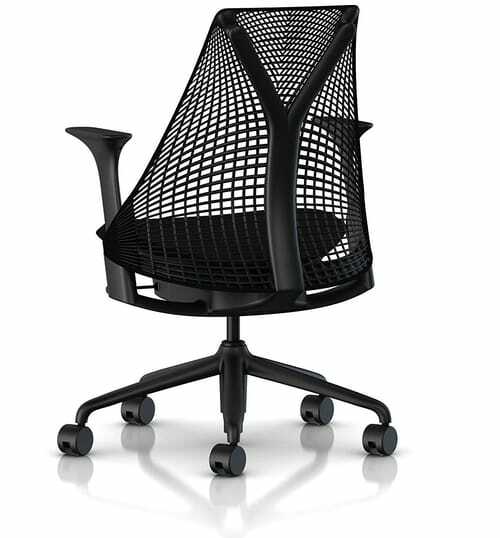 If you are looking for a modern mesh office chair that will get the attention of your co-workers or clients, this is your pick. It’s “Eco.” The chair is 93% recyclable and thanks to its structural components being hollowed out, it’s very lightweight. 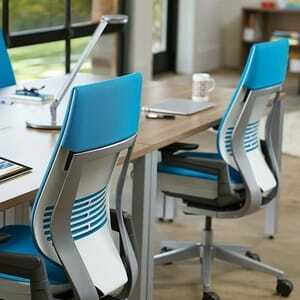 Big choice of different colors makes it very easy to find the right chair for your office. The looks don’t really go in pair with quality. Unfortunately, while it looks really cool it’s not as durable as one would expect – especially its armrests. 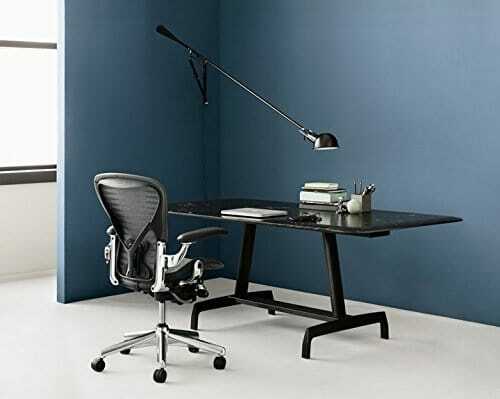 Overall, the first of three Herman Miller office chairs in my list is a decent mid-range choice perfect for someone who values design more than anything. The next listed looks completely different than its above competitor. But, that doesn’t mean it’s any worse. 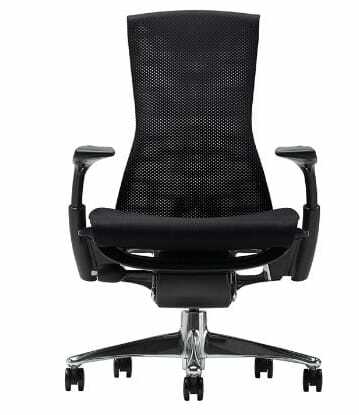 Especially that it is made by one of the most recognizablehigh end office chair brands – Steelcase. If you are looking for an all-time classic, you will fall in love with Amia. The chair, while very simple in design, it’s just as comfortable as you would expect from it – especially considering its price point. In fact, I think that it comes with just the right number of features average of his employee needs. Lots of adjustments. You can quickly adjust both the seat as well as the arms, what makes it very easy to find the right position for your back. Advanced lumbar protection. 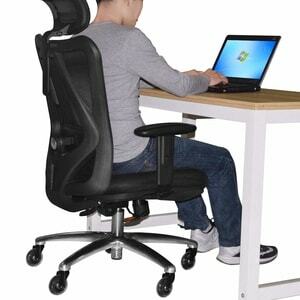 Very comfortable for those who suffer from frequent lower back problems when sitting in a standard chair. Highly durable. The chair is well known for lasting a very long time. Lots of color choices. It’s easy to find exactly the one you like. It comes with wheels made of very hard plastic which damage hardwood floors. The only way to prevent it is to cover the floor. Despite its subpar wheels the chair itself is very good and will definitely fit any office where comfort and classic furniture are a must. 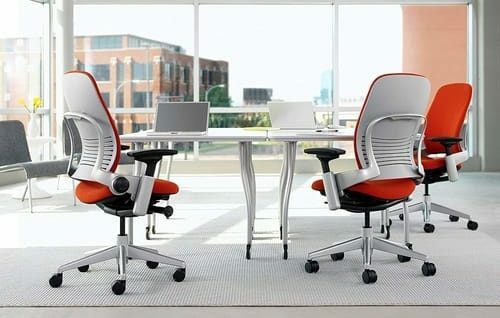 The second from Herman Miller office chairs doesn’t look as futuristic as the previously reviewed model. But is it just as comfortable and, even more importantly, worth the price? 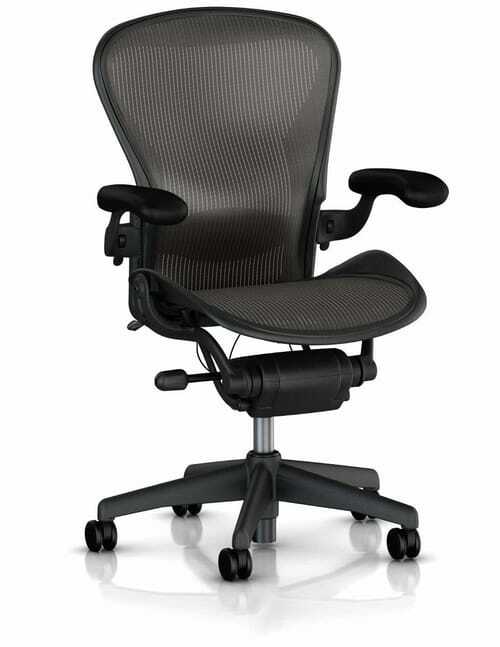 The Aeron chair is all about lumbar support and protection of your lower back. Its designers put a lot of work to ensure that long hours spent in it won't have a negative impact on this very sensitive part of your back. On top of that, thanks to its breathable mesh it feels comfortable even after long hours of sitting. When it comes to the assembly, the hardest part to put it together is getting it out of the box. Strong emphasis on lower back health. 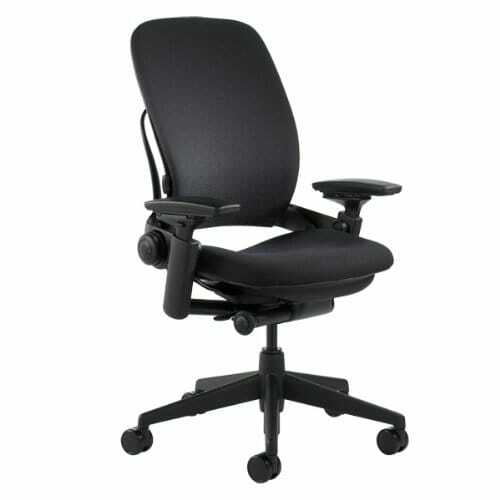 The lumbar support is adjustable to suit your usual sitting position. Many of those who bought it specifically to ease their problems with sciatica pain reported that it helped them tremendously. Keeps you comfortable and motivated while working. Synthetic materials. Unfortunately, I would expect a bit more from a brand like Herman Miller. The materials feel very artificial. Cheap looks. Even though it is very comfortable, it looks cheap (subjective opinions). 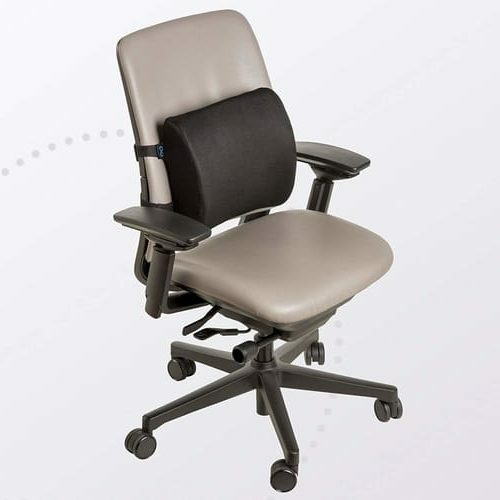 When it comes to lumbar support, it easily beats some of its more expensive competitors. Unfortunately, it’s a bit behind them in other aspects such as overall adjustability and general comfort. But, if lower back is your priority, click the button below and see the details yourself. If you’ve been working on a typical, non-ergonomic chair for years, sometimes spending $1000 on a high-end office chair may seem ridiculous. In this case, it’s worth lowering the pricing point that you target – as long as the chair is of high quality. Not everyone has to invest in a $1000 or so chair right away. While those top of the range chairs will obviously be much better than this one, Modway Jive Highback is an excellent choice to move from an uncomfortable and dangerous chair to something healthier. At less than $200, you can choose from quite a few colors and other variations (armless, high back and mid back). Great price. 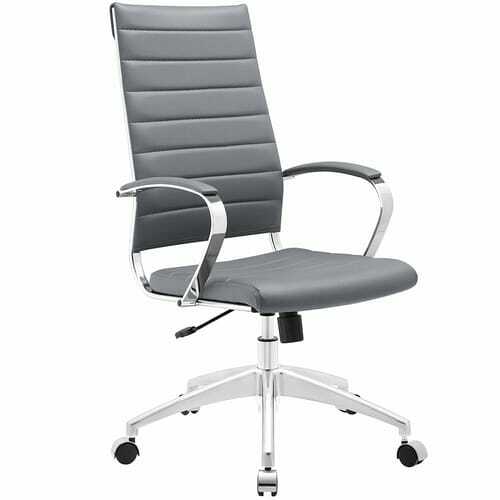 The only chair in its pricing range that I can qualify as a “high-end office chair” based on quality. A lot more comfortable compared to its equally priced competitors. It’s a real game-changer in its pricing range. Thanks to the heavy-chrome, durable armrests it doesn’t wobble and looks super professional. No tools required to put it together. There is very little that you need to set it up other than taking it out of the box that it comes in. Comes in a few colors that suits your office (even with indoor trees​​​​​). Not the most comfortable seating. The back is very flat, which may not be the best choice for people with frequent back pains or those who don’t like hard surfaces. Because of the above, it doesn’t provide any quality lumbar support. 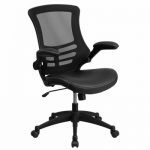 Modway Jive Office Chair is great for everyone on a budget and those who would like to energize their teams but can’t afford to spend thousands of dollars on furniture. And while you can choose its armless version, I highly recommend against it – it’s neither comfortable nor ergonomic, and can even sabotage your productivity. 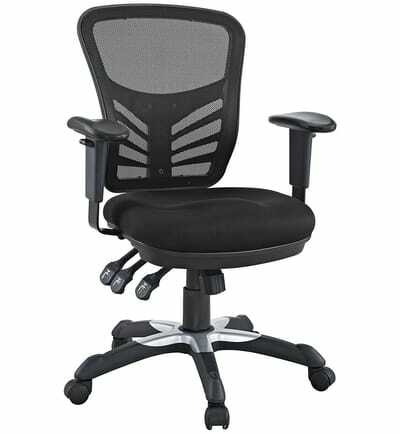 The first chair in the list that comes with a proper headrest allowing you to better control your head position during work. But is it just as comfortable as it aims to be at first glance? 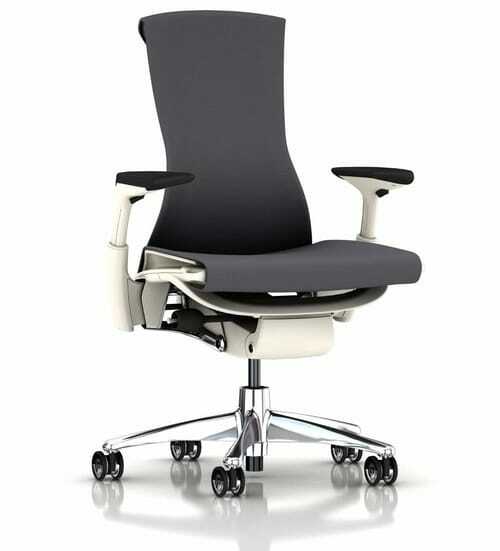 If you were to name one ergonomic chair based on its looks, this executive office chair would be an excellent example. 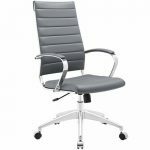 Its design puts a strong emphasis on comfort and customizability, making it very easy to adjust the chair to your liking. High-quality genuine leather which feels really great. Excellent price considering the number of adjustments. 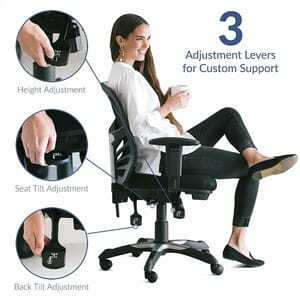 For example, its 3D Armrests can be adjusted backward, forward, as well as up and down. Unfortunately, some of the adjustments come at a cost. While you can put the back of the chair into one of four positions, the wealth of options makes it unstable and causes wobbling. Comes in a very poor packaging. Plenty of users reported receiving it damaged. 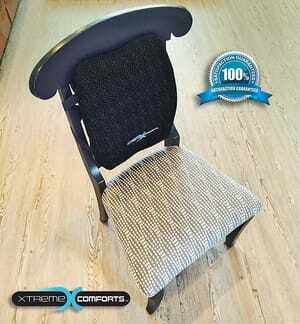 The lumbar bolster is very prominent, what can be uncomfortable after long periods of time. The short seat makes it a poor choice for tall people. Overall, it’s a great chair especially if you consider that it comes with plenty of adjustments. Unfortunately, it feels very incomplete and rushed – especially if you think about the shipping problems. 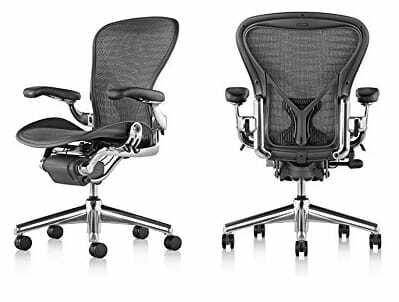 The last of Herman Miller office chairs costs over $1,000 more than each of the other two. What makes it so expensive and is it worth the money? At first glance, it doesn’t look super expensive. It has no headrest and doesn’t look as if it had a lot of adjustments. However, in reality this is THE high-end office chair. Its quality is top-notch and it beats its competitors by leaps and bounds. Made in the US – comes without saying. Highly durable. It can be used for months without any signs of wear. Thanks to its size, it is comfortable even for tall people. 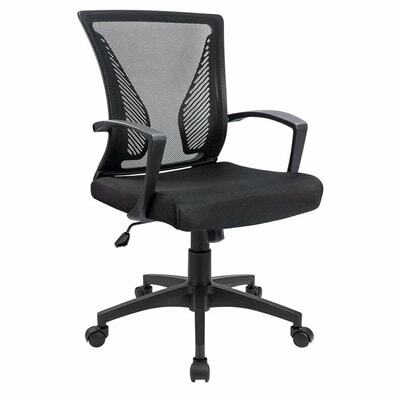 In fact, it’s the best chair office chair for tall people – although a bit pricey. Comes with a 12-year warranty and offers unbeatable repair service. 30-day money-back guarantee on a $1,500+ product – a deal that is quite uncommon. The price. But it rocks the price to quality ratio. Embody is both the best chair over $1,000, the best chair for large person and the best overall. It proves that you get what you pay for. The X4 is a great compromise between price and quality. While it’s a bit more affordable than the above-reviewed Embody, it’s not far behind it in terms of overall quality, comfort, and the number of features. But where the X4 excels the most is its design. Although it’s a completely subjective opinion, I believe it’s the best-looking expensive office chair in the whole list, period. 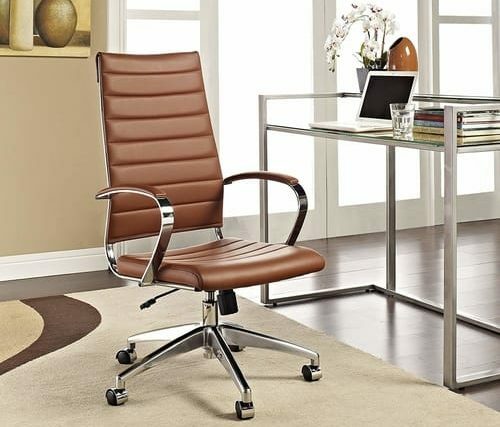 The chrome and leather combination will fit any modern and professional office space. Not to mention the level of comfort that the chair can offer. Unique design. Although it comes in just two variations color-wise, it’s hard to find a chair like this one anywhere else. It comes with a huge number of adjustments including an independently adjustable headrest. You can also get a version without one, but I believe it to be less comfortable compared to a headrest one. The arm pad adjustment is very sensitive to movements. Even though you can set it in many positions, it gets affected (read: moves) with any stronger bump. Despite the fact that this chair is almost fully covered in leather, the armrests themselves don’t come with a leather padding which is both strange and uncomfortable. A perfect choice for any office of a busy professional. But beware – the seat feels like one of a sport car. This means that while it’s super comfortable, you’re better not dreaming about driving a car while working . 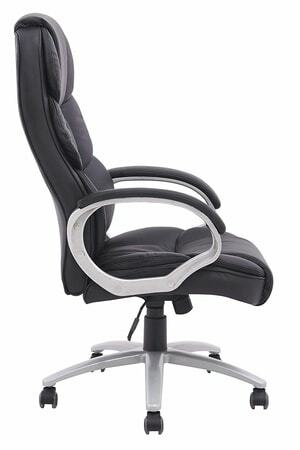 The “classic” ergonomic chair of one of the most respected high-end office chairs manufacturers in the industry and its number one bestseller. How does it compare to other tremendous choices listed? The Leap Chair is designed to “live” with its owner. 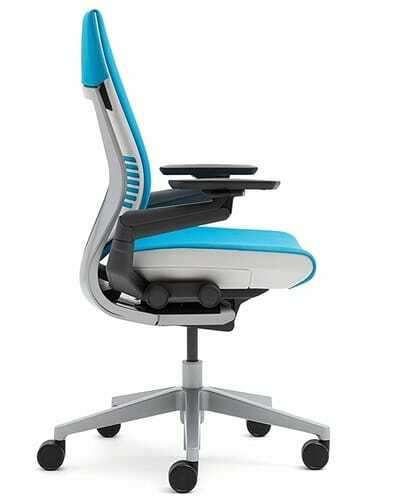 This means that it mimics your natural spine shape throughout the workday and slowly adjusts to the way you sit, helping you feel more comfortable over a longer period of time. This makes it much easier to stay productive and prevent fatigue. It’s not just adjustable – it adjusts to the user, what has a positive influence on the overall comfort. On top of that, it’s hard to find something that you could not adjust in it – elevation, incline, lumbar support and armrests can all be configured. There’s a lot of space in the seat making it a great choice for a large person. The breathable material helps you feel fresh even after hours of working. You can control lower back firmness using a separate control. Despite all the adjustments, it lacks the ability to change a seat angle, making it rather uncomfortable for tall people. Unfortunately, it’s very easy to get a refurbished item – so read the terms of purchase very carefully. 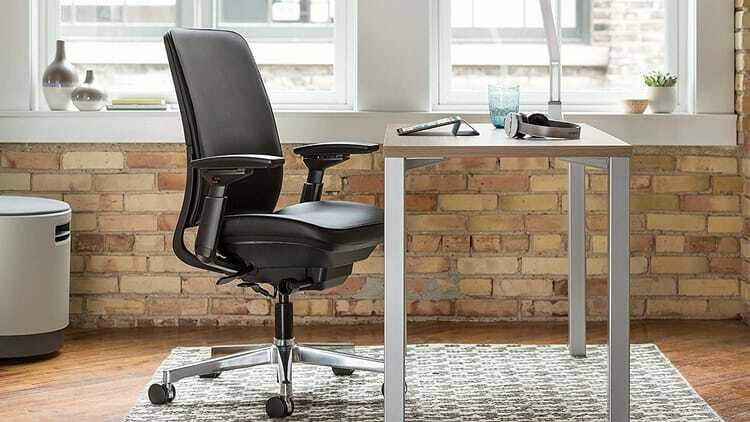 The last of the expensive office chairs reviewed is Leap’s younger brother which comes with a slightly more modern look at a bit higher pricing point. A Leap from the Leap? 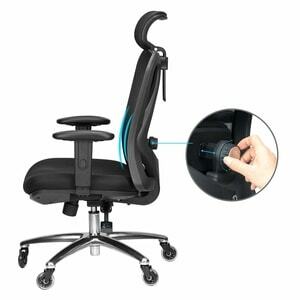 The designers behind Gesture worked hard to improve the 3D Liveback system even more, making the chair better at adjusting to different postures and sizes of its users. It “feels” and learns the user to provide him with as much comfort as possible. Leaning back is a very smooth process, which makes it shine even compared to its predecessor. Its design looks a lot modern than that of Leap. The padding is not as comfortable as in Leap. Sadly, I think that the Steelcase’s all-time classic, despite its slightly outdated looks was more comfortable. The weird angle of the seat pan makes it feel as if the chair was trying to push you forward out of it. You need to pay extra for lumbar support – while it’s not much, the sole fact of it is a real deal-breaker. Even though it’s a very good chair (and, compared to some cheap chairs in the market, it’s a terrific one), I believe it to be just slightly worse than Leap. Choosing an expensive office chair is never an easy process. But if you treat it as an investment that’s designed to boost your productivity, the price no longer looks that high. Especially if you do the math and consider that every additional hour of productive time means more money in your pocket. Not to mention all the health benefits and time spent doing what you love. If you haven’t decided yet which chair you want to have in your office – scroll up to the table and review all models once again. And, if you are completely remodeling your office, don’t forget to check our modern desks too!